James McCutchen James (August 27, 1874 – September 23, 1901) was a professional baseball player. He was a right-handed pitcher over parts of six seasons (1894–1899, 1901) with the Washington Senators, Baltimore Orioles and Brooklyn Superbas. He was the National League strikeout champion in 1897 with the Washington Senators. For his career, he compiled a 79–80 record in 178 appearances, with a 3.43 ERA and 593 strikeouts. Following his breakout year with the Washington Senators he was sold to the Baltimore Orioles where he achieved stardom with a 27–15 record, pitched 40 complete games in 42 starts, and had an earned run average of 2.36. He was second in the league with 178 strikeouts, fourth in ERA and fourth in complete games. For many years that team would be considered one of the best ever. With James as star pitcher the team included such baseball legends as John McGraw, Willie Keeler, Hughie Jennings, Wild Bill Donovan and other stars of the baseball world. The following season the owners of the Baltimore Orioles purchased a half interest in the Brooklyn Bridegrooms (dubbed the "Superbas" by the media) and took their best players with them. This included James, Jennings, Keeler, Jim Hughes and Joe Kelley. 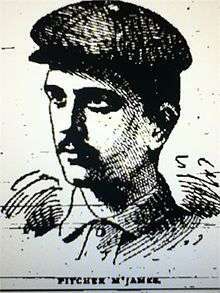 During the final game of 1899, his first season with the Superbas, James came within one out of throwning a no-hitter in his 4–0 victory over the Boston Beaneaters (forerunner of the Boston Braves). The no-hitter was spoiled by future Hall-of-Famer Hugh Duffy with a ninth-inning single. James went by his correct name of James James during his first season, then changed to "Doc McJames" for the remainder of his career. It is speculated that he did so to hide knowledge of his baseball career from him parents, as playing baseball was not entirely reputable at the time. He had a clause in each of his major league contracts preventing teams from playing him on Sundays. Before playing professional baseball, James attended the University of South Carolina. He was the first Gamecocks baseball player to make it to the major leagues. In addition, he played guard on the school's inaugural football team in 1892. James was born in Williamsburg County, South Carolina. At the peak of his career he attended medical school at the Charleston Medical College (now Medical University of South Carolina) in the off-season, graduating after 3 years in 1900. He later left baseball to briefly practice medicine with his father and brother in South Carolina. While making a house call he was thrown from a horse-drawn carriage and within a month died from complications in Charleston, South Carolina at the Medical University of South Carolina. He was the age of 27 when he died. James was the great-grandson of Judge William Dobein James, who, at age 16 served in the Williamsburgh Militia under General Francis Marion, during the American Revolution. William James later wrote a Life of Marion, which is much used today as a reference because of its first-hand information. Doc McJames was also the great-great grandson of Major John James, chief officer under Francis "Swamp Fox" Marion of Revolutionary War fame. Dr.James practiced medicine in Cheraw, South Carolina. Cheraw was an active baseball town in this period and produced several other noted baseball players. Dr. James is buried in Old St. David's Cemetery in Cheraw, South Carolina.